Download the Supplemental Rules as a Printable PDF. *Feld Entertainment strictly adheres and enforces all venue guidelines at each respected event venue. *All participants must present a valid driver’s license or valid photo ID at event registration. If under the age of 18 your parent/guardian MUST sign release forms and remain present with the minor all day. Your parent/guardian must present a valid driver’s license or valid photo ID. NO EXCEPTIONS. *For Information on obtaining additional Rider Medical Insurance Coverage for Supercross Futures contact the AMA at 1-800-AMA-JOIN (secondary coverage only). *Register online at www.supercrossfutures.com. With the popularity of the event, rider spots are limited in each class. Pre-registered riders will receive gate pick preference for heat races. Pre-registration deadline is 11:59PM EST the Monday before the event. Should a class not fill up, on-site registration will be available on Saturday from 11:00pm-5:00pm. No Sunday entry will be permitted. Times are subject to change. *Persons less then 16 years of age are not allowed in mechanic’s area or other restricted areas. *A valid photo ID is required to purchase a mechanic’s pass. Each rider is allowed one mechanic to accompany the rider through staging and in the designated mechanic’s area. A mechanic’s pass also allows you access to the pits as well as general admission during the Supercross Futures event. A designated rider/mechanic’s seating area will be assigned at each event. Mechanic’s passes are available for purchase onsite in the registration area. Persons less then 16 years of age are not allowed in mechanic’s area. There will be NO registration on-site Sunday morning. *Tickets are available at the venue box office or online at www.supercrossfutures.com. The ticket will allow you access to both the designated spectator seating as well as the pits. Tickets will allow you into the pits at the following times. All race personnel, officials, riders, mechanics and anyone associated with riders and photographers must not consume or be under the influence of intoxicants or drugs that could affect their normal mental or physical ability. Besides affecting the safety of the meet, any such use is inconsistent with the concept of good sportsmanship and is harmful to the sport of motorcycling. Anyone found to be in violation of these policies is subject to disciplinary actions and can lead to forfeiture of AMA membership or event credential. *Access to the racetrack is a privilege. Conduct on and around the racetrack is outlined below. *Respect the people around you. Including but not limited to: riders, team members, Feld Entertainment staff, AMA staff, medical staff, flaggers, security staff, building staff, TV staff, and photographers. Foul language and disrespectful behavior will not be tolerated. *Mechanics must remain in the mechanic’s area at all times while riders are on the track. At no time is a mechanic allowed out of the mechanic area to other portions of the track. *No pictures or video may be taken from the track area without approved camera pass and appropriate photographers vest or video shirt. *Open toe shoes and crutches will not be allowed on the track. *Mechanics’ must present a clean and neat appearance. *Only appropriately dressed persons displaying proper mechanic passes will be allowed in the pit, signaling and starting areas. *Cut-offs, sleeveless shirts and open-toe shoes are prohibited in the mechanics area, starting area and infield. Shirtless individuals are also prohibited in these areas. *Mechanics are encouraged to wear a collared shirt and/or uniform shirt. *Mechanics’ are encouraged to display the AMA patch on uniform shirts. *Persons less then 16 years of age are not allowed in mechanic’s area. *Any person caught trespassing without the proper credential or caught assisting someone to trespass on to Venue property may be subject to prosecution under applicable laws. *Designated entrances must be used when entering the Venue or paddock area. *Any person found breaking, climbing over, or opening the fence or otherwise entering the paddock area at a non-designated entrance gate will be subject to prosecution under applicable laws. *Credentials (including rider and mechanic bands) must be worn at all times while in the paddock area, on the track, or within the Venue. *Your credential is your responsibility and is non-transferable. Persons violating this policy will be subject to removal from the Venue and prosecution under applicable laws. *Any person who counterfeits, forges, or alters credentials (with the intent to defraud) is guilty of a misdemeanor and subject to prosecution under applicable laws. *Feld Entertainment reserves the right to revoke credentials at any time. > *The only proper credentials are those issued by Feld Entertainment as determined in its sole and absolute discretion. *Credentials must be worn and visible at all times by the individuals to whom the credentials were issued; and such credentials are not transferable and may not be distributed, given away or sold. *Any persons violating these policies shall be subject to immediate removal/eviction from the Venue and may also be subject to prosecution under applicable laws. *The distribution or sale of any merchandise, promotional items or marketing items is strictly prohibited without the prior written consent of Feld Entertainment. *The Team Space (“Team Space”) is defined as the space in the paddock area of the event Venue (“Venue”) assigned to your team by Feld Entertainment. *Specific Venues may require unique paddock layouts and may therefore limit the use of a team’s awnings, umbrellas, ez-ups and other equipment. *ALL competitor transport vehicles must have a 40BC class fire extinguisher in their approved pit area. *Bicycle barricades and portable restrooms ordered by Feld Entertainment at each Venue are for pit party use and will be dispersed where needed at the sole and absolute discretion of Feld Entertainment. *Parking within the Venue parking lot will not be free of charge. *Staging is prohibited within the Venue parking lot without prior approval from Feld Entertainment. Pre-staging is not permitted at the Venue prior to the Tuesday before the event at 5pm and staging at some Venues may be limited or unavailable in the days preceding the event, and Venues may choose to impose fines for improperly parked vehicles. *Free parking is not guaranteed. *Drones are prohibited at all times within the paddock, venue and surrounding properties. *Razors, Bicycles, Hoverboards, Skateboards and all other wheeled conveyances as decided by Feld Entertainment are not to be in operation during open paddock hours. *All trash must be disposed of in approved containers in accordance with applicable laws. *The dumping of fuel, motor oil, coolant, grey water, and black water in the paddock area or on the Venue property is strictly prohibited and violators are subject to immediate eviction from both the paddock area and the Venue and may be subject to prosecution under applicable laws. *Certain Venues may prohibit the washing of bikes, trailers and other equipment. It is each team’s responsibility to determine and fully comply with such Venue rules and regulations. *Certain Venue regulations may require you to use the approved fuel dump area in accordance with the local fire marshal and any such regulation must be complied with in every respect. All containers must be marked with rider’s team name or number. All containers must be removed from the fuel depot by 11:00 pm on the day of the event. Containers left at the fuel depot are subject to a fine and fee for hazmat disposal. Violator’s may be subject to prosecution under applicable laws. *Certain Venue regulations may require the local fire marshal to inspect Team Transporters for approved fuel containers or drums. All containers must be in accordance with state or local regulations. Each team must fully cooperate at all times with local fire marshal. Failure to fully comply with the local fire marshal may subject violators to prosecution under applicable laws. *1st offense will result in a written warning to the team referencing the guideline(s) violated. *2nd offense will result in placement of team and all related vehicles and equipment at the back of the paddock area for the next event following such violation. *3rd offense will result in the placement of team and all related vehicles and equipment in the back of the paddock area for the next three (3) events following violation. *4th offense will result in the placement of team and all related vehicles and equipment in the back of the paddock area for the remainder of the season, and team sponsor activations/displays of any type at the new location will not be permitted for the remainder of the season. *In addition to these Supercross Futures supplemental rules all racing is governed by the 2019 AMA Racing Rulebook. Eligibility:To be eligible to race in any of the Supercross Futures classes riders must be age and skill appropriate to the class they will be competing in and must hold a current AMA membership. Non-Eligibility:Riders in either the B (intermediate) or C (novice) that have won a class championship two (2) or more times ;in the Supercross Futures AMA National Championships must advance to the next skill level the following season in Supercross Futures. *If a rider is advancing prior to or during the 2019 Supercross Futures season he/she must continue to participate in the higher classification. *Riders are encouraged to contact the AMA prior to the Supercross Futures season to confirm their 2019 eligibility status. *Challenges to rider eligibility for Supercross Futures must be received by the AMA no later than five (5) business days after the conclusion of the race in which the participant qualified. Rider eligibility challenges received after this date will be accepted at the sole discretion of AMA. *Challenges must be in writing and sent by certified mail or email to the following addresses: AMA, Attn: MX Manager, 13515 Yarmouth Dr., Pickerington, OH 43147 or [email protected]. *The Open A Class will pay back 100% of entry fee money for that class. *Top 10 in the 250SX Futures class, at the Supercross Futures AMA National Championship, earn their license. Riders that currently hold or have held a Supercross license in the past three competition seasons are not allowed to compete in this class. AMA licensed riders not competing in AMA sanctioned events for a period of three years may lose their prior classification. Applicants renewing a license that has been expired for more than three years must meet the present requirements for a Supercross License. This requirement may be waived under special circumstances through an appeal made to the AMA. *The champion of the previous year’s Supercross Futures AMA National Championship is required to use the #1 only if they are defending the class they earned the championship in. *Pre-Registered riders have number preference. *Onsite registered rider numbers are on a first come first serve basis. At each event, all number plate stickers will be available on site. If a third party produces number plates and/or jerseys for you prior to meets, they may download the official logos at www.supercrossfutures.com. *All classes consist of a minimum of: one practice session, one heat race, one LCQ (if applicable), and one Main Event. *Race formats with the qualifying procedure, laps, and times will be distributed at each event. *Transponders are mandatory. If you own a MyLaps compatible transponder, you may run your own. If you do not own one, a transponder may be rented on-site. *Online pre-registered, pre-paid participants receive preferred heat race gate choice. *All other gate choices will be randomly drawn per programming. *Excludes Supercross Futures AMA National Championship. *All riders will grid centered behind the starting gate. *Additional riders may be lined up directly behind the front row. *The officially designated finish line is defined as the placement of the transponder loop which will be distinctively marked by yellow markers. *Races are officially ended for all contestants at the completion of the lap in which the checkered flag is displayed to the winner. *Riders will be credited with all laps they complete during a race unless a penalty has been assessed. *Riders who do not complete the checkered flag lap will be scored in order of finish and laps completed. *Should the checkered flag be displayed later than the official distance, the finishing order will be decided on the basis of the official distance. *Under any other circumstances, the winner is the leader at the time the checkered flag is displayed. *Should a rider be given the checkered flag ahead of the actual winner, or with the winners, the rider will be scored as having completed the race in the race position the rider was running at that time. *The top 3 finishing riders in each class from each event will qualify for the Supercross Futures AMA National Championship. *A rider may compete in multiple events, however, the first event the rider qualifies in will be the one the rider is advanced from. *All riders will advance a position in their class if another rider has already qualified out of that class in a different event. *The riders highest finishing position throughout all the events determines their heat race gate pick for the Supercross Futures AMA National Championship. *Riders are only eligible to compete in the Supercross Futures AMA National Championships if they participated and qualified in that class during the 2019 Supercross Futures season. *Additional alternates may be chosen if there are no more alternates available in that class within that event. *Additional alternates will be chosen from the event that has the highest total entry count. *If the highest total entry count is the same in more than one event, then the first event within the Supercross Futures series with the highest total entry count will be the preferred event of which additional alternates will be chosen from. 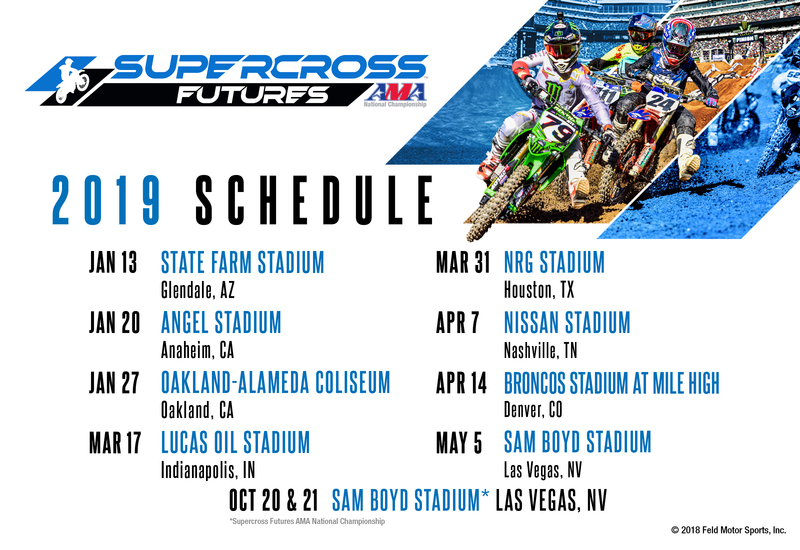 *Invitations (complete with registration information) to the Supercross Futures AMA National Championship will be emailed after completion of the season. *The race with the highest average entry count will be the method that gate assignments will be made for the heat races at the Supercross Futures AMA National Championship. *The Supermini 2 and the 250SX Futures will practice and race on Saturday the 19th of October in conjunction with the Monster Energy Cup. *All other Supercross Futures classes will race within the schedule provided. *Riders that currently hold or have held a Supercross license in the past three competition seasons are not allowed to compete in this class. *Riders that currently hold a Supercross license are only allowed to compete in this class. *A rider must be 14 or older to ride a 201cc up to 250cc motorcycle. **A rider must be 16 or older to ride a 251cc or above motorcycle.